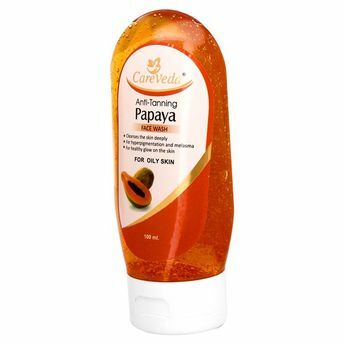 Enriched with the AHA(Alpha Hydroxy Acids) CareVeda Anti Tanning Papaya Facewash gently exfoliates the skin thus reveals a clean and fairer looking smooth skin. It makes the skin fairer and keeps the oil production in control. Moisturizing extracts gives a velvety feel to skin and brighten the skin complexion. Additional Information: Careveda Herbal LLP provides Optimum Ayurvedic solutions for all your hair & skin problems.